The BSE Sensex closed 130.77 points, or 0.36%, up at 35,980.93, and the Nifty 50 ended 30.35 points, or 0.28%, higher at 10,802.15. Bharat Dynamics Ltd said it has received a contract worth about Rs 760 crore with the Indian Army for production and supply of anti-tank guided missiles (ATGM) and launchers. Bharat Dynamics shares surged as much as 9.59% to Rs 304.90 per share. 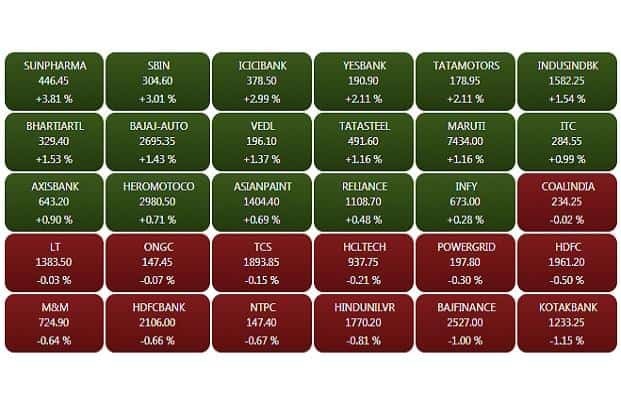 The BSE Sensex gained 156.59 points, or 0.49%, to 36,006.75, and the Nifty 50 rose 41.60 points, or 0.39%, to 10,813.40. The BSE midcap index was down 0.10%, while the smallcap edged up 0.17%. 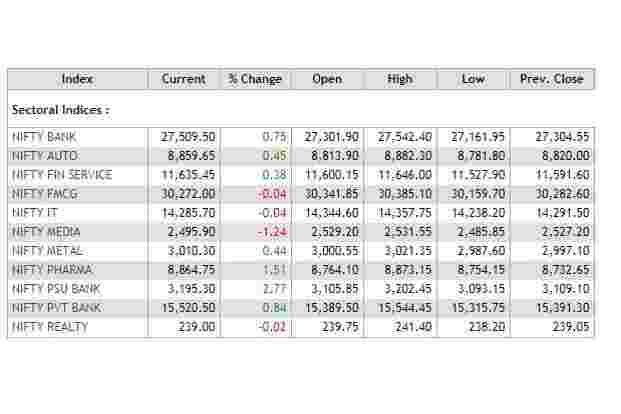 Among the sectoral indices on BSE, telecom and bankex rose over 1% followed by healthcare, auto and metal. Capital goods, power, utilities, consumer durables and oil and gas declined. Jindal Steel and Power Ltd has shipped over 55% of the order bagged from Indian Railways to supply about one lakh tonne rails, said Naushad Ansari, Joint MD, JSPL said. Shares traded 2.5% up at Rs 155.85 per share. JSW Steel said its crude steel production rose 3% in the third quarter of fiscal year 2018-19 to 4.23 million tons from 4.11 mts in the same period last year. For the nine-month period this year, the production was up 5% to 12.52 mts. Shares traded 0.4% up at Rs 290.70 per share. The Supreme Court held that Monsanto’s patent claim on genetically modified (GM) Bt. cotton was valid. The court set aside a 2 May order of the division bench of the Delhi high court which had held that plant varieties and seeds cannot be patented under Indian law by companies like Monsanto Inc., and that royalties on GM technology would be decided by a specialized agency of the agriculture ministry.As a result, the patent held by Monsanto, through its Indian arm Mahyco-Monsanto Biotech Ltd (MMBL) over its Bollgard-II Bt cotton seed technology, a GM variant which resists the bollworm pest, was decreed to be unenforceable in India. Monsanto India shares traded 4.5% up at Rs 2,698.80 per share. Intraday, the stock jumped 13% to Rs 2,917.65 per share. Endurance Technologies shares traded 0.3% up at Rs 1,215 per share, after rising over 1% to a high of Rs 1,225 earlier. The company said it has acquired Fonpresmetal Gap SpA, an aluminum die casting company in Italy. Jet Airways shares fell as much as 1.5% to Rs 242.50. Domestic and foreign lenders of Jet Airways (India) Ltd have asked the company to explain its liquidity situation, just a few days after the airline defaulted on a scheduled loan repayment, Mint reported. The lenders will now meet the airline executives, along with various vendors, and help Jet Airways renegotiate contracts and revive its poor cash flow position in the coming days. The Indian rupee was trading lower against the US dollar after crude oil prices surged in eight out of nine trading sessions. At 9.10am, the rupee was trading at 70 a dollar, down 0.46% from previous close of 69.68. The home currency opened at 69.84 a dollar and touched a low of 70.01 a dollar. 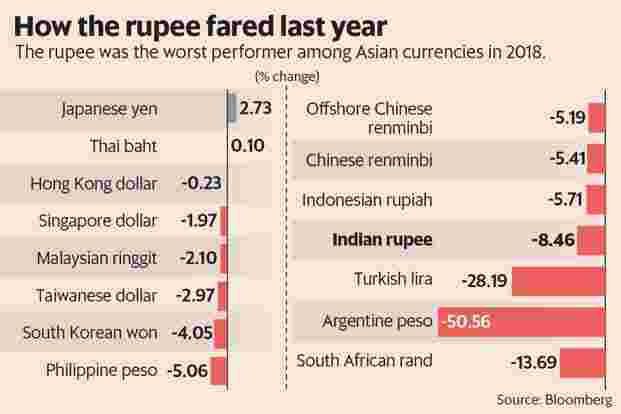 So far this year, the rupee has declined 1.3%, while foreign investors have sold $203.80 million in equities and bought $43.50 million in the debt markets.